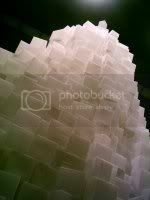 Skellywag: New photos - Rachel Whiteread etc. Also some new pics in the Urban Life series. The Whiteread boxes were impressive, but only I think in terms of scale (feeling like an ant, or some kitchen cockroach amidst the sugar-cubes). You could say something about "space turned inside out" but, meh, why not with 10,000 cardboard boxes? An awful lot of hydrocarbons went into that sculpture. I enjoyed the Rousseau exhibition. It was interesting to go twice and see actually how good he was: his compositions and use of colour are both particularly interesting. He always balances his colours very well - I suspected that a histogram would show nice bell curves, as indeed it does. Kahlo's work is less balanced. R also had an unusual way of composing pictures - the jungle scenes all follow pretty much the same lines, and are almost exactly the opposite of the heuristics in use for photography: central, small focal point, symmetry, lots of distracting detail.